Elizabeth Marie Boston charter fishing vessel is Conveniently located in Scituate, MA between Boston Harbor and Green Harbor Marshfield. EM Fishing fishes around Boston Harbor, Stellwagen Bank, Mass Bay, Cape Cod Bay, and the shores of Plymouth Massachusetts. 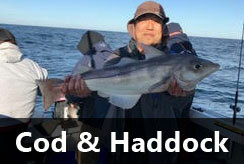 We specialize in Shark fishing, Tuna fishing charters, Cod/Haddock, Striped Bass fishing, and we also target Bluefish. 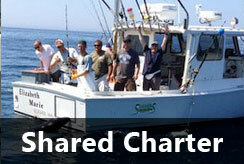 Come join us for the Boston fishing trip of a lifetime, we cater to anglers of all skill levels. If you’re in town on vacation, business, or a local you’ve come to the right place if you’re looking for action-packed fishing and highly rated customer service EM Fishing has you covered. Boston shark fishing heats up during the month of July but peaks once the water temperatures have risen to their summer heights later in the month of July through the end of September. 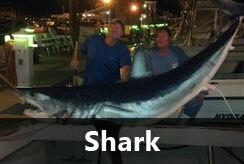 Shark fishing is typically very consistent with large Blue Sharks being the most common species we catch. These sharks put up a huge fight and are impressive fish to say the least. The other shark species that we encounter are Mako, Porbeagle, and Thresher Sharks. 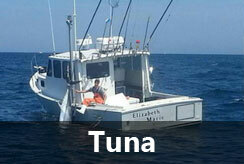 You haven’t experienced Cape Cod deep sea fishing until you’ve gone Tuna fishing on the Elizabeth Marie! In the last season, the Elizabeth Marie brought in Blue Fin Tuna at a record pace. School Tuna range from 60 to 250lbs! There’s no fish in the sea that will offer you the fight and experience of reeling in a Tuna. 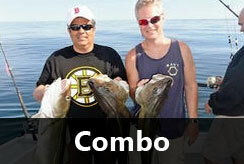 Cape Cod Bay and the surrounding waters offer some of the best striper and blue huge striper on the East Coast. 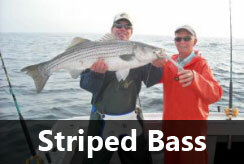 The spring run of Striped Bass begins in the middle of May and remains consistent well into October. The first week of June typically opens up the floodgates and limiting out on keeper Striped Bass is common throughout the spring and early summer months. The Bluefish show up a week or two behind the Stripers and remain one of the most reliable and challenging species of sport fish in the World. Come aboard the Elizabeth Marie with Captain Rob and Crew for the fight of you life!